Keep your Mustang sealed up tight with this 1994-04 Mustang inner and outer door belt weatherstrip kit! Keep the windows and interior on your SN95 or New Edge Mustang sealed up tight and looking right with a set of inner and outer door belt moldings! This kit will replace the door belt moldings on both sides of the car inside and out. These Mustang beltline moldings are constructed with factory style materials for an OEM look and function! The Mustang inner door belt weatherstrip is located at the top of the door panel on the interior of your Mustang. This piece keeps debris out of the inside of the door to protect vital pieces such as the window motor and regulator. If you start to see scratching on your window tint or glass, then it's time to replace these. 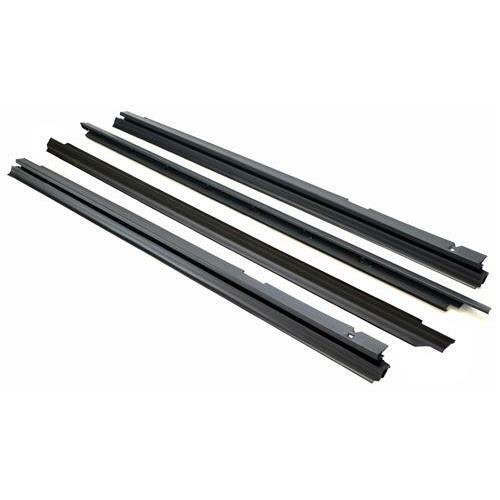 The outer door belt weatherstrip is a vital piece of rubber that keeps moisture out of your door to prevent failure to the window motor and other components. Over time this piece will dry rot and crack which scratches your window and allows elements inside. Ensure your Mustang interior stays nice and dry with a new pair of these! Replace your worn out inner door belt weatherstrip with this direct replacement kit for 1994-2004 Mustang! This kit includes both pieces for the driver's side and passenger side. The inside door belt weatherstrip attaches to the top edge of the inside door panel and helps keep debris clear from inside the door panel. Constructed with factory style materials that ensure an OE look for the interior of your Mustang. Replace your dry rotted 1994-04 Mustang door belt moldings with this direct replacement kit! These are also referred to as dew wipes. These pieces attach to the outer top portion of your door and wipe the window clean as it is raised and lowered. Over time they will deteriorate and cause scratches on your window. This kit is a direct replacement and is made with the factory style material for a perfect fit and function.